Bee venom is a mixture of several components with proven therapeutic benefits, among which are anti-inflammatory, analgesic, and various cardiovascular conditions. In this work, we analyzed for the first time the proteomic content and biological properties of the crude venom from Apis mellifera syriaca, a honeybee from the Middle East region. Using high-performance liquid chromatography-tandem mass spectrometry, we evidence the venom contains phospholipase A2, hyaluronidase, mast cell-degranulating peptide, adolapin, apamin, and melittin. The latter was purified by solid phase extraction method (SPE) and tested in parallel with crude venom for biological activities. 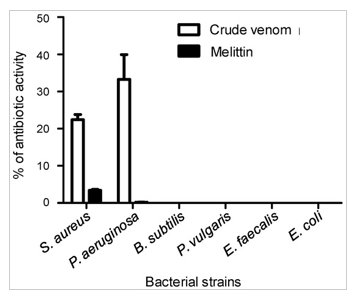 Precisely, crude venom-but not melittin-exhibited antibacterial activity against Staphylococcus aureus and Pseudomonas aeruginosa strains. Alongside, hemolytic activity was observed in human blood subjected to the venom at high doses. A. mellifera syriaca venom displayed antioxidant activities, and not surprisingly, PLA2 catalytic activity. 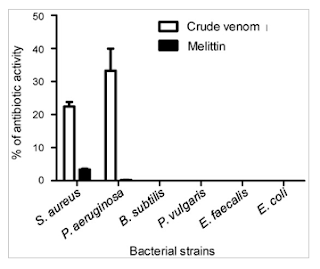 Eventually, the venom proved to exert antiproliferative effects against MCF-7 and 3T3 cancer cells lines. This first report of a new bee venom opens new avenues for therapeutic uses of bee venoms.